Malaria - body, last, contagious, causes, What Is Malaria? 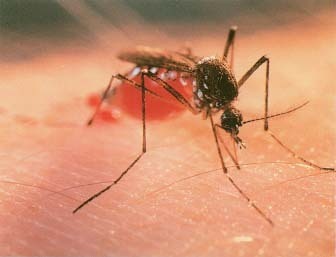 Malaria (mah-LAIR-e-uh) is a disease caused by a parasite that is spread to humans by the bite of an infected mosquito. Malaria, which literally means bad air, was once thought to be spread in the air around stagnant marshes. It is now known that mosquitoes, particularly female Anopheles (a-NOH-fel-eez) mosquitoes, spread the parasites that cause malaria. Four different species of a parasite in the genus Plasmodium (plaz-MO-dee-um) cause malaria. They are falciparum (fal-SIP-ar-um), malariae (ma-LAIR-e-eye), ovale (o-VAL-e), and vivax (VI-vax). Of the four, P. falciparum is the most common and the most deadly. Plasmodium requires time in both the mosquito vector * and human host * to complete its life cycle. Forty percent of the world's population is at risk for contracting malaria from infected mosquitoes, primarily in tropical and subtropical regions. Worldwide, there are 300 to 500 million cases of malaria and more than one million deaths from malaria each year. More than 90 percent of all malaria deaths occur in sub-Saharan Africa, a vast area south of the Sahara Desert, and 75 percent of deaths occur in children. Plasmodium falciparum causes malaria in this region, and poverty, poor nutrition, and poor access to health care all contribute to the high death rate, Malaria is increasingly common in Central and South America, Asia, the Middle East, and the Pacific Islands. About 1,200 cases of malaria are diagnosed in the United States each year, mostly in recent immigrants or travelers from countries where malaria is found. Mosquito control has virtually eliminated malaria in areas with temperate climates. However, the disease is making a comeback as mosquitoes become resistant to insecticides and Plasmodium becomes resistant to medications used to treat malaria. * vector (VEK-tor) is an animal or insect that carries a disease-causing organism and transfers it from one host to another. In most of Latin America, Africa, the Middle East, and Asia, people are at a higher risk of getting malaria. Drug-resistant malaria has caused the disease to be on the rise in these parts of the world. malaria parasites contained in that person's blood. The parasites need an incubation period * of about 1 week in the mosquito before the mosquito can spread the disease when it bites another person. Once in a person's body, the parasites travel to the liver where they can remain dormant, or inactive, for months or even years. In the liver, the parasites grow and multiply and are then ready to move into the body's red blood cells, where they continue to grow until the red blood cells burst, freeing more parasites to attack more blood cells. The parasite can be ingested by a mosquito and spread to another person only during the time that Plasmodium is in the blood. * incubation (ing-kyoo-BAY-shun) period is the time between infection by a germ and when symptoms first appear. Depending on the germ, this period can be from hours to months. Malaria causes fever and symptoms similar to those of the flu. In the early stages of the disease when the parasite is in the liver, the infected person does not feel sick. When the parasites invade the red blood cells and cause them to burst, toxins (poisons that harm the body) are released into the blood and the person experiences fever, chills, sweating, headache, muscle aches, and tiredness. Symptoms typically begin 9 to 16 days after infection with the parasite, but the time may vary depending on the infecting species. Episodes of these symptoms reoccur every 48 to 72 hours. Other symptoms may include nausea (NAW-zee-uh), vomiting, and diarrhea (dye-uh-REE-uh). Under the microscope, a blood sample from a person who has malaria will show one of the four species of Plasmodium parasites within the red blood cells. Malaria is treated with antimalarial drugs, many of them derived from quinine, which is found naturally in the bark of the cinchona tree from Peru. Which drug is chosen to treat a patient depends on the parasite causing the infection, the severity of symptoms, the age of the patient, and whether the parasite is resistant to certain drugs. Some patients may need intensive hospital care. Treatment can last several weeks or months. In some infections, the parasite can remain dormant in the liver for months or years and the disease may return even after treatment. Destruction of red blood cells in cases of malaria can result in anemia * and jaundice * . Severe and untreated infection may cause liver and kidney * problems, seizures * , mental confusion, coma * , and death; malaria is fatal in 1 in 500 cases. Children and pregnant women are particularly vulnerable to complications. Infected pregnant women are at risk for miscarriage * , premature delivery * , and stillbirth * , and anemia in children can have long-term effects on growth and development. * premature delivery is when a baby is born before it has reached full term. * stillbirth is the birth of a dead fetus. Scientists, in searching for alternative means of malaria control, have recently been able to genetically modify mosquitoes carrying a form of malaria that affects rodents. The genetically modified mosquitoes were less susceptible to infection after feeding on a malaria-infected mouse and were far less likely than normal mosquitoes to transmit the malaria parasite to other mice. repellent, and staying in a screened or air-conditioned room from dusk to dawn when mosquitoes are most active. Bed nets treated with certain insecticides repel mosquitoes for 6 to 12 months. Travelers to foreign countries where malaria is found should take preventive drugs prescribed by a doctor before leaving. Scientists are working to develop a vaccine that will prevent malaria. However, the different species of Plasmodium and the complicated life cycle of these parasites have made developing a vaccine difficult. Jones, Ann. Looking for Lovedu: Days and Nights in Africa. Knopf: New York, 2001. The author's account of her journey across Africa in search of the legendary Lovedu tribe is full of adventure and complications such as malaria. World Health Organization (WHO), Avenue Appia 20, 1211 Geneva 27, Switzerland. WHO provides information about malaria at its website.